Fairly even first round, an argument could be made for both boxers. Fitness looks to be the deciding factor in this fight, can Foster maintain the pace through 12 rounds. Foster Jnr has only fought once in the last year and is looking rusty. Crolla is hitting him accurately with quick combinations..
10 - 9 for Crolla there. 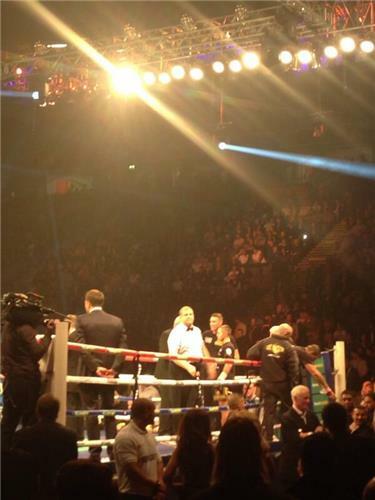 Sky have caught up with Carl Froch in the dressing room, he's expecting to be in the ring in 'a couple of hours'. 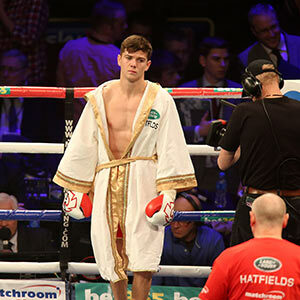 Say what you like about Luke Campbell's performance tonight, but you can't deny he came to the ring in a beaut of a dressing gown. Both fighters have started trading single shots now, Crolla's superior movement is giving him the upper hand though, giving him another 10 - 9 round. Round five under way - Crolla seems to be digging to Foster's body regularly now. The plan seems to be: slow him down and then pick him off in the later rounds. It's not looking good for Foster Jnr. He's all heart but he's starting to look very tired now. Another round for Crolla. And that's it! Foster Jnr's corner have called it off between rounds. 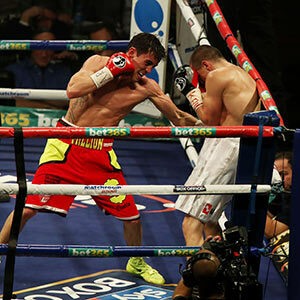 The body shots were the big difference, Crolla couldn't miss in the final round there. Crolla defends his WBO Intercontinental title. He'll be hoping to step up a level next year. Speak of the devil. Next up to fight is Andy Lee, trained by Adam Booth. Andy Lee could do with a good performance here to ensure he's mentioned along with the likes of Darren Barker, Matthew Macklin and the like. Well, Hafner makes it out of the first round. Replays of the shot that dropped him show it was a real sickener of a left to the ribs. Hafner down again, a right this time. Hafner down again and the ref has called it off. Right decision from the official, Lee's left hand looked like it had a radar on it, couldn't miss. Adam Booth dismisses rumours that he'll be making an appearance in Groves' corner tonight but wishes his old charge well. WBA super-bantam weight title is on the line. Froch by KO the overwhelming choice from MSN users.